Fitzpatrick Castle is an 18th Century 4 Star Castle Hotel offering stylish surroundings, friendly personal service and award winning food. 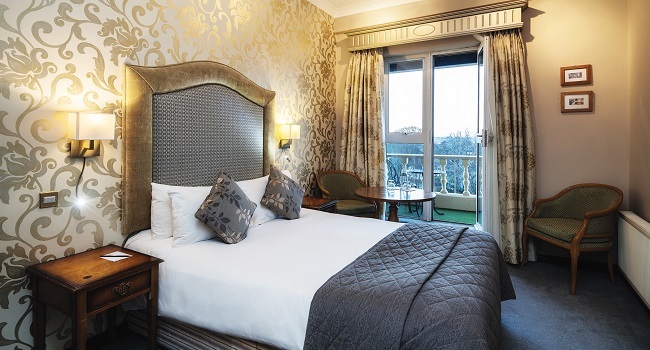 Situated at the brow of Killiney Hill in the prestigious south Dublin suburb of Killiney, the hotel enjoys stunning views out over Dublin Bay. With over a hundred luxurious bedrooms and magnificent suites, the hotel is a prime location for elegant weddings and celebrations. Just 14km from Dublin’s bustling city centre, Fitzpatrick Castle Hotel is the perfect spot for a luxurious trip to the city where you can retreat away from it all. TheTaste and Fitzpatrick Castle Hotel are offering readers a luxury overnight escape with breakfast and dinner in Mapas Restaurant for only €179.00. Mapas Restaurant is the newest edition to the Fitzpatrick Castle Hotel. It pays tribute to the strong Fitzpatrick family tradition and Killiney Castle’s illustrious heritage over centuries. Mapas in one of the finest Dalkey Restaurants. Led by Executive Chef Sean Dempsey, he brings you a menu prepared with the very best of Irish, locally sourced seasonal produce.